Ever since ancient times, the Dai folks of Xishuangbanna are tightly bound to bamboos and almost all their clothing, food, living and traveling are related with bamboos. Even their villages are always sheltered in the bamboo bushes. Their ability for recognizing and using bamboos reached to the degree to make outsiders surprise; of them, I believe the most exquisite and skillful using of bamboos must be cooking and making tea in bamboos. The bamboo the Dai folks use to cook food and to make tea is tinwa bamboo; this sort of bamboo usually has a diameter of 5 cm, and the joints is thin and long, inside the barrels, there is a layer of bamboo membrane, which is extremely sweet. When they cook food, they first cut the bamboo at one joint, the other joint will be used as the bottom of the cooking utensil; then, they put the clean and saturated sticky rice in the bamboo barrel and put into some fresh water; then, they plug the opening end with bamboo leaves or banana leaves and started to broil the bamboo barrel on the fire; when the water in the barrel is dried up, they will place the barrel flat and change the sides of the broiling over small fires, soon, the food will be ready. It is quite fastidious to have such meals. They must first scrape the burned outer skin of the bamboo, then tap the barrel slightly, so that the rice can separate with the barrel completely, then they scratch some cracks on the barrel and shuck off the bamboos layer after layer, at last they get the rice cooked in bamboo barrels. This kind of rice is fresh, clean, soft and sweet; more, the fragrance of the bamboo and the rich mix together, and it is really sweet and tasty. However, it is very difficult for everybody to enjoy such a delicacy, because the Dai folks only serve such a dish when they receive distinguished guests. To make tea in the bamboo barrel is a bit different. They first cut the bamboo at one joint; the other joint will be used as the bottom of the utensil; then, they put the tea in and bake it over small fires; when smells come out of the barrel, they will put into the boiling water, then they get the tea. The tea they get in this way has a yellowish green color, it is clear and bright, and gives of a fragrant smell; if try it carefully, you will find it is a bit sweet after bitter, and it makes the drinker feel clear, relaxed and happy. In 1951, the Dai folks of Xishuangbanna treated Professor Cai Xitao, a famous botanist in China and the founding father of the tropical plant park of Xishuangbanna, with such a meal. After that, professor Cai remarked: “their use of bamboo has no rivals in the world. The bamboo is first used as a pot, then a bowl, then fuel and then as the nutrition of other plants; this is really making use of local materials in the most appropriate ways”. 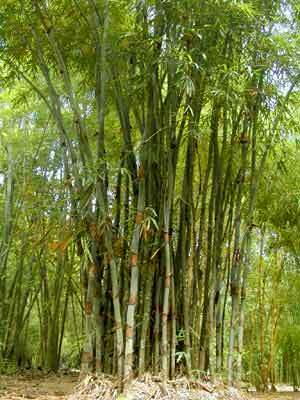 Besides, the tinwa bamboo can also be used for ornaments, weaving and making fences.